A survey against the draft genome sequence and the cDNA/EST database of Ciona intestinalis identified a number of genes encoding transcription factors regulating a variety of processes including development. In the present study, we describe almost complete sets of genes for Fox, ETS-domain transcription factors, nuclear receptors, and NFκB as well as other factors regulating NFκB activity, with their phylogenetic nature. Vertebrate Fox transcription factors are currently delineated into 17 subfamilies: FoxA to FoxQ. The present survey yielded 29 genes of this family in the Ciona genome, 24 of which were Ciona orthologues of known Fox genes. In addition, we found 15 ETS genes, 17 nuclear receptor genes, and several NFκB signaling pathway genes in the Ciona genome. The number of Ciona genes in each family is much smaller than that of vertebrates, which represents a simplified feature of the ascidian genome. For example, humans have two NFκB genes, three Rel genes, and five NFAT genes, while Ciona has one gene for each family. The Ciona genome also contains smaller numbers of genes for the NFκB regulatory system, i.e. after the split of ascidians/vertebrates, vertebrates evolved a more complex NFκB system. 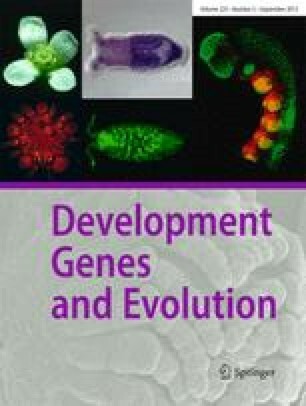 The present results therefore provide molecular information for the investigation of complex developmental processes, and an insight into chordate evolution. Supplementary material is available for this article at 10.1007/s00427-003-0322-z and is accessible for authorized users. This research was supported by Grants-in-Aid for Scientific Research from MEXT and JSPS, Japan to Y.S. (14704070) and N.S. (12202001). K.Y. was a Predoctoral Fellow of JSPS with a research grant (13003747). We thank Kazuko Hirayama, Chikako Imaizumi, Asako Fujimoto, and Hisayoshi Ishikawa for their technical support. Supplementary material, approximately 96 KB.